The contoured detector head is a less common detector head, which will provide better performance than the flat detector, although not as good as an enclosed head. The contoured option is popular for applications where maximum sensitivity is required, but it is not possible to cut the belt to install an enclosed head. Other applications include contoured conveyors, where the product would sit a long way from sensing face of a standard flat detector head. 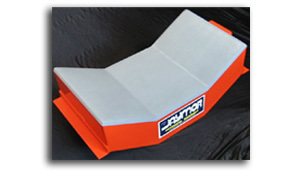 The head is designed to sit beneath the conveyor belt, as with the flat head, but has a profile specifically designed to match that of the conveyor. As with all Jaymor detector heads, the mounting brackets and lead junction box can be located at any position to suit the customer's requirements. For more information about our products, please contact us.